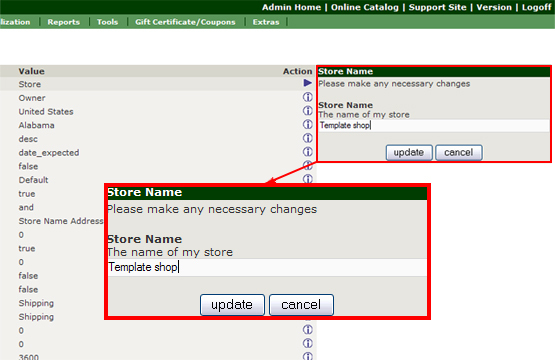 As soon as you have logged in onto ZenCart’s administration panel (/admin panel), you will gain access to the configuration settings of your shop with the template installed. First of all, you can change the name of your shop. To do so you need to go to Configuration tab. There you will see the drop down menu. Simply, choose and click on My Store entry. You will see a large list of attributes that describe the layout of your shop. Select Store name and you will see the Edit button on the right. Click on this button and enter your new shop name. Then press Update button to save your changes. As soon as you do this you will see that the shop has already been changed. All other shop configurations can be changed in exactly the same way. (E.g. name of the owner, country, taxes, etc.). This entry was posted in E-commerce Templates, ZenCart, ZenCart Tutorials and tagged e-commerce, install, ZenCart. Bookmark the permalink.